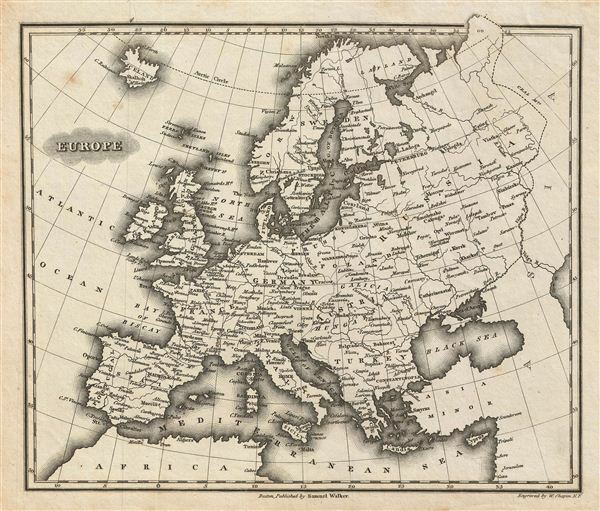 This is an attractive example of the 1828 Malte-Brun map of europe. The map covers the continent in its entirety from the Atlantic Ocean to the Ural Mountains and from North Cape in Norway to the Mediterranean Sea. It includes Spain, Portugal, Turkey in europe, european Russia, Austria, Germany, France, Ireland, Great Britain, Scandinavia and Italy. Following the defeat of Napoleonic France and the Congress of Vienna, europe is here under a new peaceful balance of power, centered around the five most important powers (also referred to as the five ‘Great Powers') of the United Kingdom, France, Russia, Prussia and the Austrian empire. Alas, the ‘peace' was but an illusion and europe was anything but calm. Old rivalries festered and nationalism, liberalism, revolution (industrial and otherwise) were on the rise across europe. Various, important rivers, islands, cities and other topographical details are noted. This map was published by Samuel Walker in 1828 as part of the American edition of Conrad Malte-Brun's System of Geography, Vol. I.